Writing an acceptance speech can be difficult to do, even prominent figures have their own speech writers. 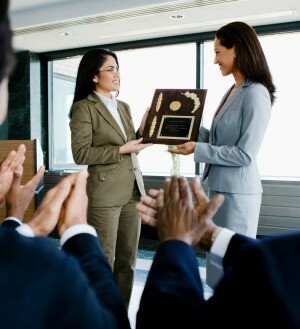 This is a guide about speech ideas for receiving an award. I'm getting and award as the best employee from my company and I want to say thank you to my boss and my management. So kindly suggest some ideas for a thank you speech. "Thank you very much for this honour. I would not be here today, accepting this award, without the help of _______ (your boss's name), and - indeed - the entire management team." Please help me how to make a thank you speech im getting 10 years in service of the bank thank you! I am receiving an award from my employers for length of service and commitment. I want you to help me with a very short speech to thank my employers. Tell them how much you have enjoyed working there and how much this award means to you. Then mention the people who have helped you during your time there. I would mention it is an honor to work on behalf of a great company (if it is a great company) for x amount of years. Thankful to receive this employee award and looking forward to more years at this company!